The activation codes for EA's 'Online Pass' enabled games can expire, leaving gamers without access to a games' online features until they contact EA support. 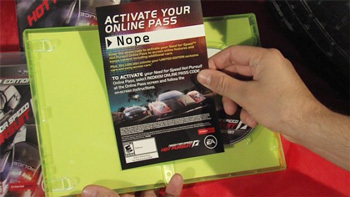 As one NeoGAF user found out when he broke open his brand-spanking-new copy of Need for Speed: Hot Pursuit for the 360. He couldn't access the game's online features because the included activation code had gone the way of bell-bottoms,Windows 98 and 'the cake is a lie' references. When he posted his grievance on the NeoGAF forums, several other users came forward claiming they'd encountered the same issue. A clause allowing EA to do this was subsequently discovered in the Online Pass's EULA, and then it was torches and pitchforks all round. EA's response to an inquiry from Joystiq was hardly enlightening. Apparently, as a rule, no Online Pass should expire, except those that do. For example, Dragon Age 2's online pass expires on March 31, 2012 according to EA's EULA description, and will require players to re-download the pass, or acquire a new one from EA support. EA stresses that acquiring a new pass is absolutely free. Adding yet another hoop for consumers to jump through to an already unpopular system seems like an odd move, even for EA, so I'd wait for more clarification on the issue before setting your rage dials to 'incomprehensible.' We'll keep you updated on any further developments.